One of Australia’s most sought after horn soloists, Lin Jiang is considered to be the most exciting instrumentalist of his generation. 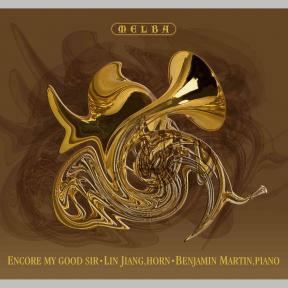 As part of its on-going commitment to showcasing the finest emerging artists, Melba Recordings is pleased to present Encore My Good Sir, the recording debut of Lin Jiang, in association with pianist, composer and Juilliard graduate, Benjamin Martin. In a diverse recital of virtuoso music for horn and piano, from Schumann’s ‘Adagio and Allegro’ – regarded as being unplayable for 100 years – to contemporary pieces at the cutting edge of horn technique, this program evinces the formidable talent of these two musicians with direct stream digital technology providing state-of-the-art sound. The disc includes music by horn player/conductor/composers Esa-Pekka Salonen and Gunther Schuller as well as Poulenc’s Elégie for the doyen of horn virtuosi, Dennis Brain. There are transcriptions of music by J.S. Bach, Marais and Ketting and works by Hindemith and Maxwell Davies. Also featured are some of Lin Jiang’s personal showpieces, including the disc’s title work, Encore My Good Sir, specially composed for him by Thaddeus Huang. This recording was supported by the Ian Potter Foundation. 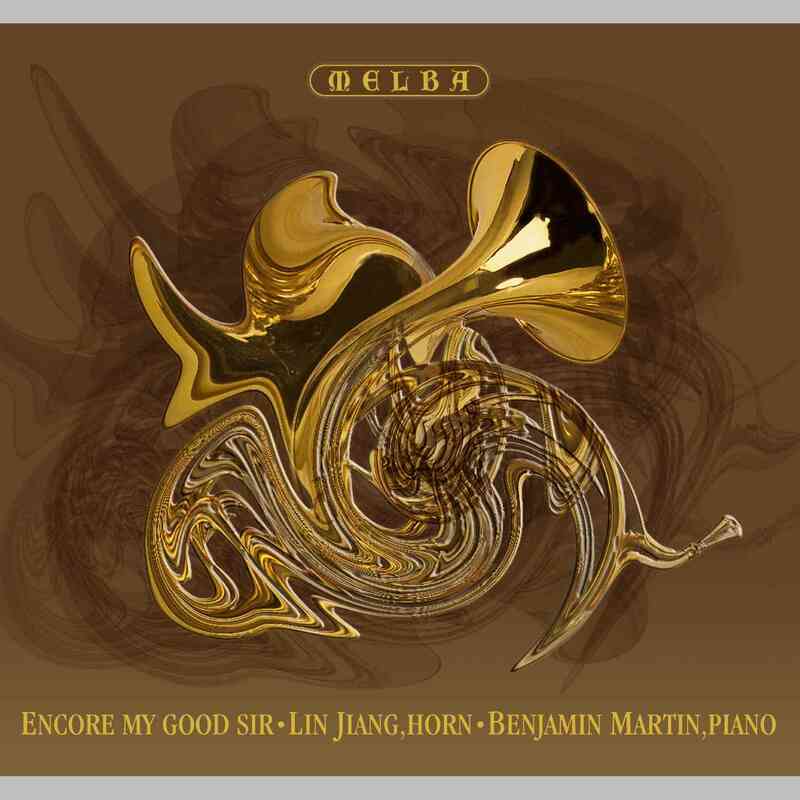 The horn first attracted composers’ interest at the end of the 17th century and although it could only play a limited range of notes it was well established as both an orchestral and solo instrument by the start of the Romantic period. The invention of valves in 1818 raised the possibility of it becoming fully chromatic but musicians were slow to accept the change and Robert Schumann’s Adagio and Allegro of 1849 (Tracks 1–2) was the first significant piece to be written for the valve horn. Composed over three days in February, the work was first played by Julius Schlitterlau accompanied by Schumann’s wife, Clara. In a rehearsal a fortnight after it had been composed, Clara enthused about its “brilliance, freshness and passion” and the Adagio and Allegro has remained one of the most popular pieces in the repertoire ever since. However, during the 1840s violinists and pianists attained such pre-eminence as soloists that other instruments were largely relegated to orchestral roles and it was not until the 20th century that composers again began to see the horn and other brass instruments as vehicles for their most serious thoughts. Some had themselves played brass instruments in their youth: Gunther Schuller, for example, was already principal horn with the Cincinnati Symphony Orchestra when he appeared with them on 7 April 1944, aged only 18, as soloist in the premiere of his horn concerto. Esa-Pekka Salonen studied with the great Finnish horn player Holger Fransmann when he was just 11, and his playing on a recording of his own work, Horn Music I (Track 7), which he wrote when he was 18, shows that he too was a fine player. Otto Ketting studied the trumpet at the Hague Conservatoire, writing Intrada to perform as part of his final examination at the Hague Conservatoire in 1958. This short unaccompanied work has since earned a firm place in the horn repertoire, and although it was many years before Schuller’s concerto was published in full, the lyrical Nocturne (Track 6) which forms its second movement has long been available in an arrangement for horn and piano. Although the German composer Paul Hindemith was one of the leading viola players of his generation, he was also adept on every other orchestral instrument and included among his compositions a sonata for each brass instrument. 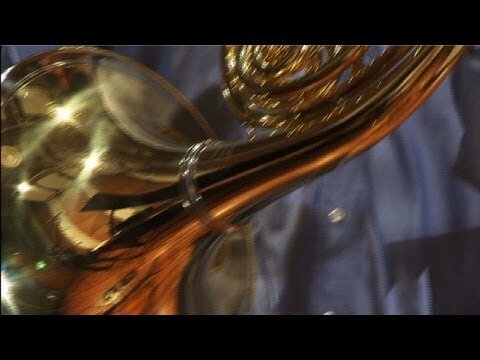 The Sonata for E flat alto horn (otherwise known as the “tenor horn”) dates from 1943 (Tracks 10–13) but this brass band instrument is so rarely heard as a soloist that the first published edition included alternative parts for saxophone as well as for the French horn, the instrument on which it is most usually played today. Many other composers were inspired to write for the horn having heard the virtuoso playing and exceptional musicianship of Dennis Brain. This was encapsulated in his memorable encore, Le Basque (Track 9), an early 18th century work which Marin Marais had originally written for viola da gamba. It was, Brain told the audience at the Edinburgh Festival on 24 August 1957, “a little French dance that also happens to be the shortest piece I know”. Neill Sanders, Brain’s 2nd horn in the Philharmonia Orchestra, gave the first performance in a BBC broadcast on 17 February 1958, Poulenc himself was at the piano. Precocious, youthful virtuosity is also apparent in Sea Eagle (Tracks 3–5), the work for solo horn which Peter Maxwell Davies wrote for the 20 year old Richard Watkins in 1982. Watkins encouraged him to write more after seeing an initial movement but as a result he only received the completed score of this phenomenally difficult work about a fortnight before the first performance at Dartington on 16 August 1982. The title of the piece refers to the White-Tailed Sea Eagle, a huge bird indigenous to the north of Scotland which was extinct there between 1919 and its reintroduction in 1975. Maxwell Davies, who lives in the Orkney Islands, knew that the birds’ bones had been found in prehistoric burial sites locally, and wrote the piece after seeing one of the newly introduced eagles in “an attempt to convey the energy and majesty of the bird”. 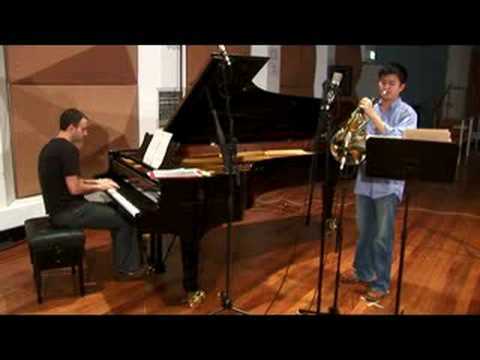 In asking Thaddeus Huang, a fellow student at Melbourne University, for a piece for horn, Lin Jiang particularly requested that it should be easy to play but sound difficult (Track 16). He then gave its first performance at Hawthorn Town Hall on 1 May 2006 and the composer commented later that, with its leaps, runs, high notes and whoops, he had certainly “managed to fulfil the second part of the request”! Lin Jiang also demonstrates his considerable virtuosity in a performance of the Gigue which concludes the third of Bach’s cello suites, BWV 1009 (Track 14). 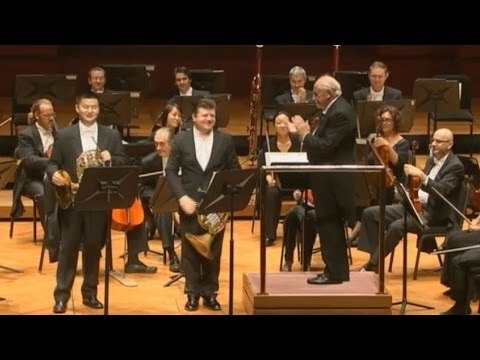 This was first arranged for horn by the American player Wendell Hoss in 1950 and demonstrates clearly the flexibility of the modern instrument.